Pro Fighting Combat is a game where you can have a lot of fun with your friends, in a great battle. Before you start the battle you have to select your fighter. You have four great fighters in this game. You can see their names and their skills. You have to chose a fast and strong fighter if you want a chance to win. It is not enough to have a strong fighter if you do not know how to control him. You have to learn his special moves, his attacks in order to win the match. 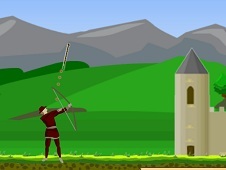 The first player in this fighting game needs the arrows to control the fighter. With left and right he will move the character and with up he will jump. In this game you can make some great attacks from the air after you jump so try them all in order to obtain a lot of damage on your opponents. At the top in the right you can see the first player`s life and in the left the second player`s life. In this exciting game appeared on our site is important to be fast if you want to dodge the enemy`s hits and to destroy him before the time runs out. You need the mouse to select your fighters at the beginning and then you have to start the battle. The second player will move with a and d and he will jump with w. In this game the first player needs four keys to attack: u, i, o and l and the second players needs g, v, b, c. In this exciting game appeared on our site the player who loses all his life is going to be the loser. The other won is going to be the winner. If you lose you should try again. DO not give up so easily if you want to become a better player you need training. Here you can challenge your friends. Do your best to become the best fighter. This new combat game is going to be great for all the girls and the boys who love 2 players battle games. Leave us a comment to tell us what do you think about fighting games. Pro Fighting Combat is one of the 475 games added to Fighting Games category, that we recommend you to play and then tell us your feedback through a comment in the dedicated section. The game Pro Fighting Combat have been played 6496 times and this game have been added on 2-Player.com on 11 August 2017, this game have been voted 46 times, and his rate is 76%. This game have been commented 0 times from players that have been played this game.